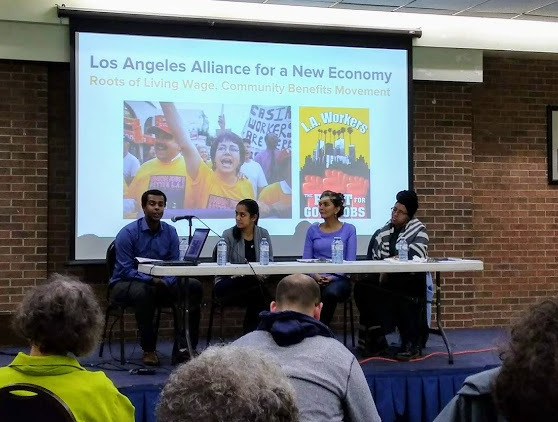 Speakers Kumsa Baker (TCBN), moderator Dusha Sritharan (TEA), Alejandra Ruiz Vargas (ACORN) and Nasma Ahmed (Digital Justice Lab) outline the background and some challenges with Sidewalk Lab’s plans for Toronto waterfront at Parliament Street and Queen’s Quay. What’s the story with the Google Toronto Sidewalk Lab Project? 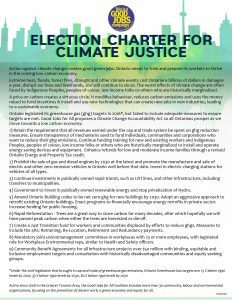 In Ontario’s 2018 provincial election, we need to continue taking action against climate change. 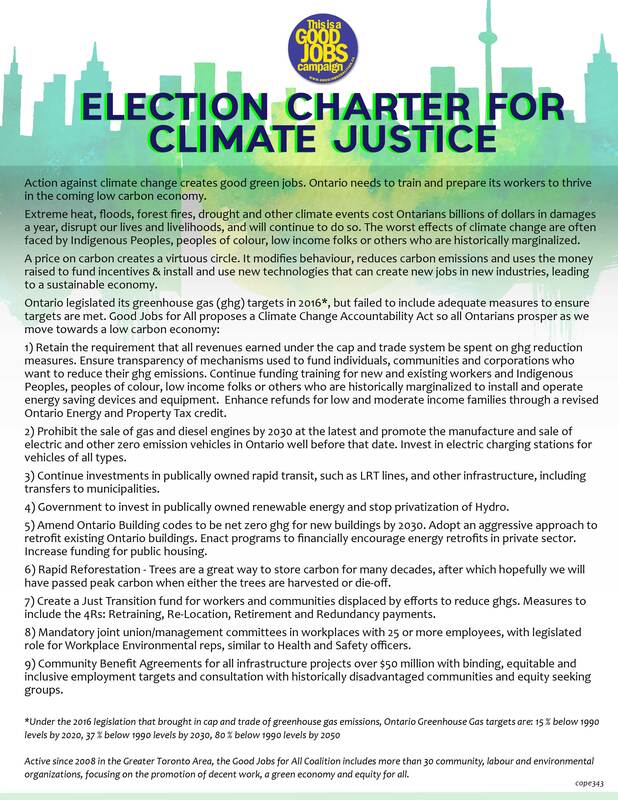 The Good Jobs for All Coalition created the Election Charter for Climate Justice to support action now and after the election on June 7th. 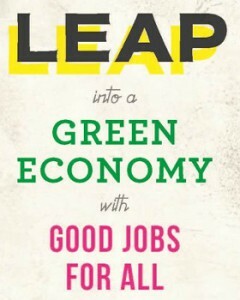 It contains nine great measures to be included in a proposed Climate Change Accountability Act. Use the Charter at all-candidates meetings, in letters to the editor, on your doorstep when candidates ask for your vote, and in other ways you use to take action. 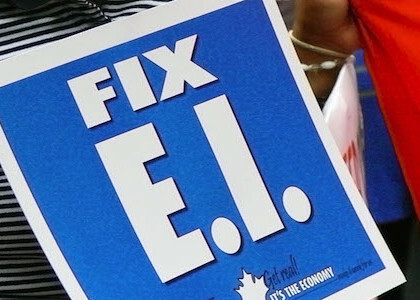 Do you support a Climate Change Accountability Act that would include adequate measures to ensure Ontario’s legislated Greenhouse Gas (GHG) reduction targets are met? The Good Jobs for All Coalition will be hosting a City of Toronto Forum on Green Jobs. 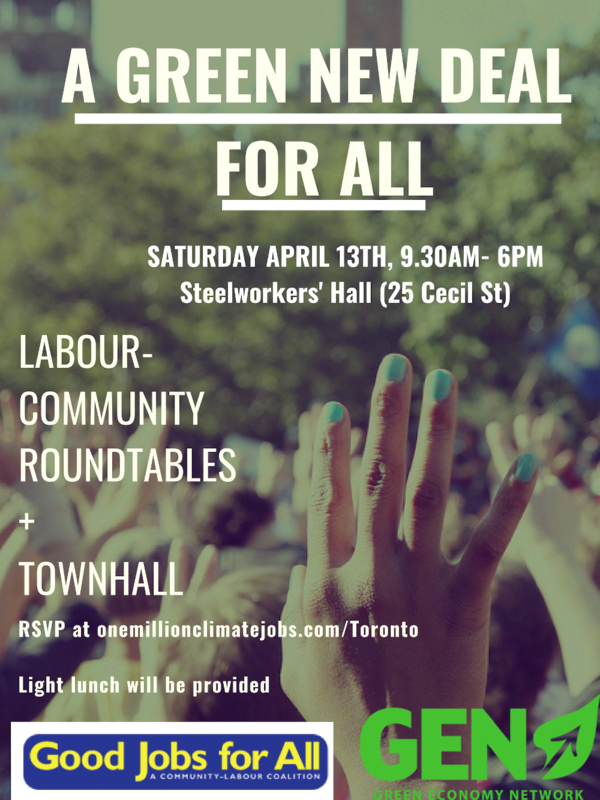 Participants will include the Canadian Federation of Students (Ontario), Professor Cheryl Teelucksingh, co-author of the 2016 report entitled “Building Toronto: Achieving Social Inclusion in Toronto’s Emerging Green Economy” for Metcalfe’s Green Prosperity series, and the Toronto-York Labour Council. 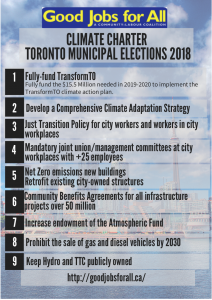 The Toronto-York Labour Council will speak to its January 2016 “Labour and Climate Change Statement”, prepared following the Paris COP21, which calls on the City of Toronto to transform its approach to energy and the environment.